The Pharos Project deals with developing an OPNFV lab infrastructure that is geographically and technically diverse. This will greatly assist in developing a highly robust and stable OPNFV platform. Community labs are hosted by individual companies and there is also an OPNFV lab hosted by the Linux Foundation that has controlled access for key development and production activities. The Pharos Specification defines a “compliant” deployment and test environment. Pharos is responsible for defining lab capabilities, developing management/usage policies and process; and a support plan for reliable access to project and release resources. Community labs are provided as a service by companies and are not controlled by Pharos however our goal is to provide easy visibility of all lab capabilities and their usage at all-times. A requirement of Pharos labs is to provide bare-metal for development, deployment and testing. This is resource intensive from a hardware and support perspective while providing remote access can also be very challenging due to corporate IT policies. 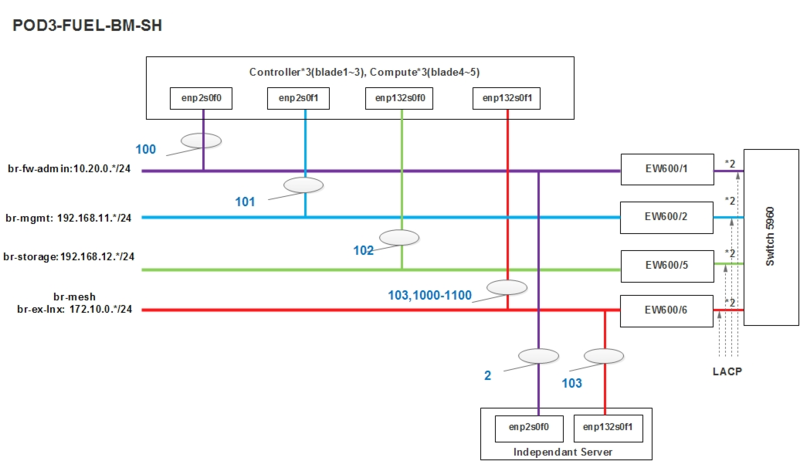 Achieving a consistent look and feel of a federated lab infrastructure continues to be an objective. Virtual environments are also useful and provided by some labs. Jira is currently used for tracking lab operational issues as well as for Pharos project activities. The Pharos Specification defines a hardware environment for deployment and testing of the OPNFV platform release. Deploying Euphrates in a Virtualized environment is possible and will be useful, however it does not provide a fully featured deployment and realistic test environment for the Euphrates release of OPNFV. In the Euphrates release you may select a variety of deployment toolchains to deploy from the jump server. Below describes the minimum for the Pharos spec, which is designed to provide enough capacity for a reasonably functional environment. Additional and/or faster disks are nice to have and mayproduce a better result. 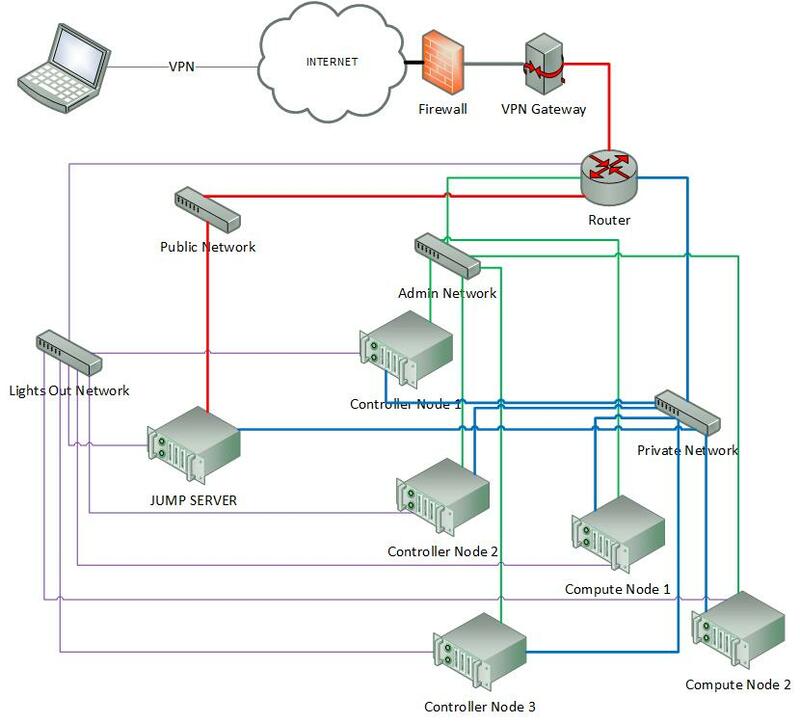 OpenVPN is generally used for remote however community hosted labs may vary due to company security rules. For POD access rules / restrictions refer to individual lab documentation as each company may have different access rules and acceptable usage policies. Packages to be installed on a system (tools or applications) by pullig from an external repo. Lab and POD templates are provided to help lab owners document capabilities, configurations and network topologies. Compute, network and storage specifications with network topology details are required to help developers use lab resources efficiently while minimizing support needs. This also greatly assists with troubleshoting. It is the responsibility of the lab owner to keep individual lab documents updated and determine appropriate level of detail that is exposed publicly through the Wiki or maintained in a secure Pharos repo securedlab with controlled access. To avoid deplicated content, it is suggested to directly include the rst docs in the wiki. Before Danube release, securedlab is only opened for Infra WG committers and installer projects’s contributors. Since Euphrates release, it is opened for all the contributors of Pharos project, if you are the owner of a community lab, please ask helpdesk to become a Pharos contributor in order to submit your PDF to the securedlab repo. The goal of the Pharos Project is automation of resource provisioning. This requires machine readable inventory and network configuration files that follow common format. POD Name: Use consistent naming / numbering to avoid confusion. Hyperlinked to POD description. 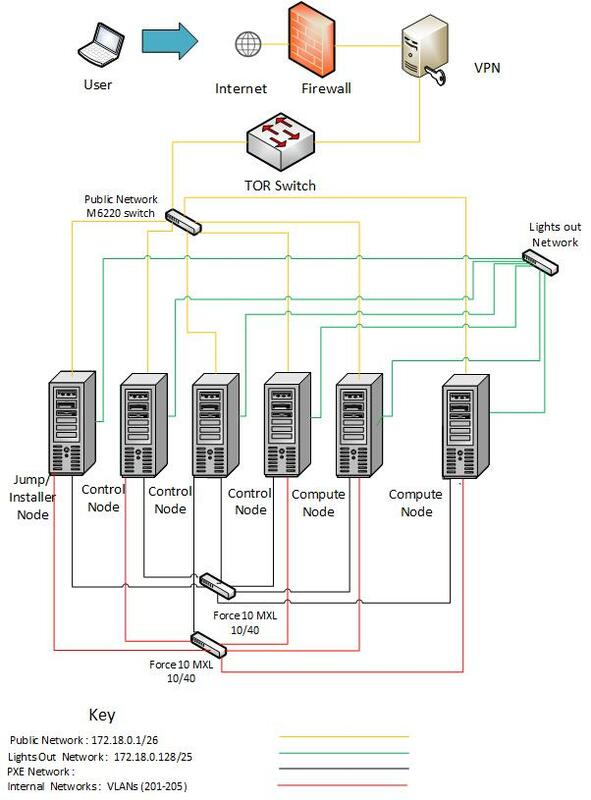 Provide a diagram showing the network topology of lab including lights-out network. Any security sensitive details should not be exposed publically. The following diagram is an example only. 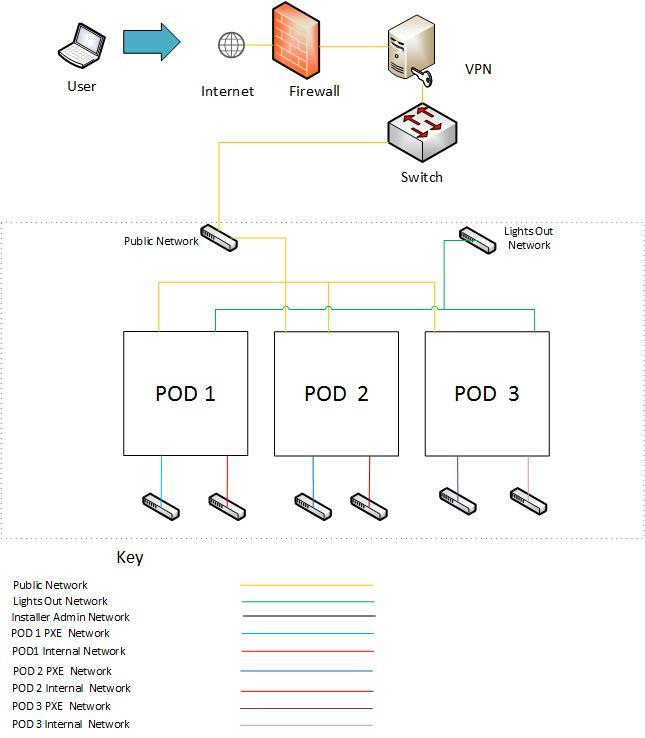 Provide a diagram showing the network topology of the POD. Any security sensitive details should not be exposed publically and can be stored in the secure Pharos repo. The following diagram is an example only. The PDF(Pod Descrition File) provides template for POD’s hardware information for all the installers in yaml. The target is to use the same PDF file to deploy a POD by any installer with any scenario it supports. 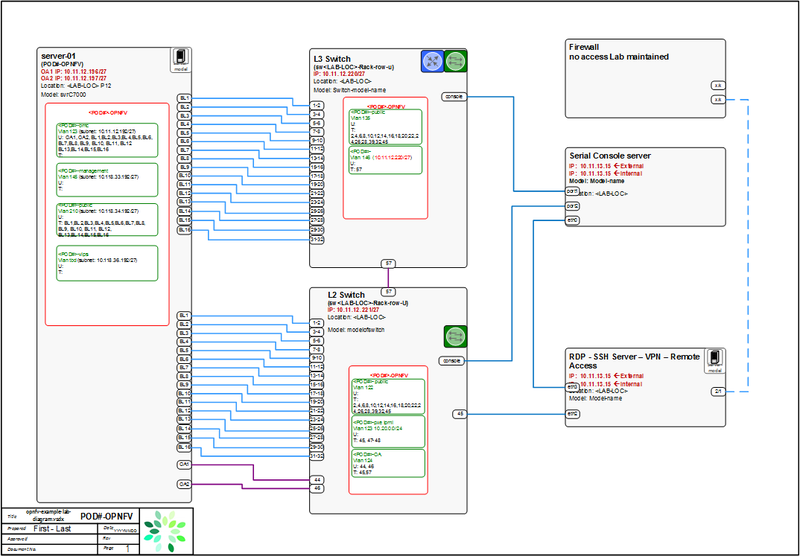 It is the base of the dynamic CI , LaaS(Lab as a Service) and SDF(Scenario Description File). Currently Jinja template is used to transfer the PDF to the specific installer’s template. PDF, Jinja template and the transfering tools are all stored in securedlab. You can find the latest PDF template in https://gerrit.opnfv.org/gerrit/#/c/38283/8/labs/lf/pod4.yaml. OPNFV development, test and production activities rely on Pharos resources and support from the Pharos community. Lab owners and Pharos project committers/contributors will evolve the vision for Pharos as well as expand lab capabilities that are needed to help OPNFV be highly successful. Pharos configuration documents provide information on how to setup hardware and networks in a Pharos compliant lab. Jira is used to track Pharos activities including lab operations. Lab resources can be used for and declared as either Development (bare-metal or virtual) or Production/CI (bare-metal or virtual). If a resource is used for and declared as Development resource, it can not be used for and declared as Production/CI resource at the same time and vice versa. Changing the resource declation must be brought in to Infra WG. 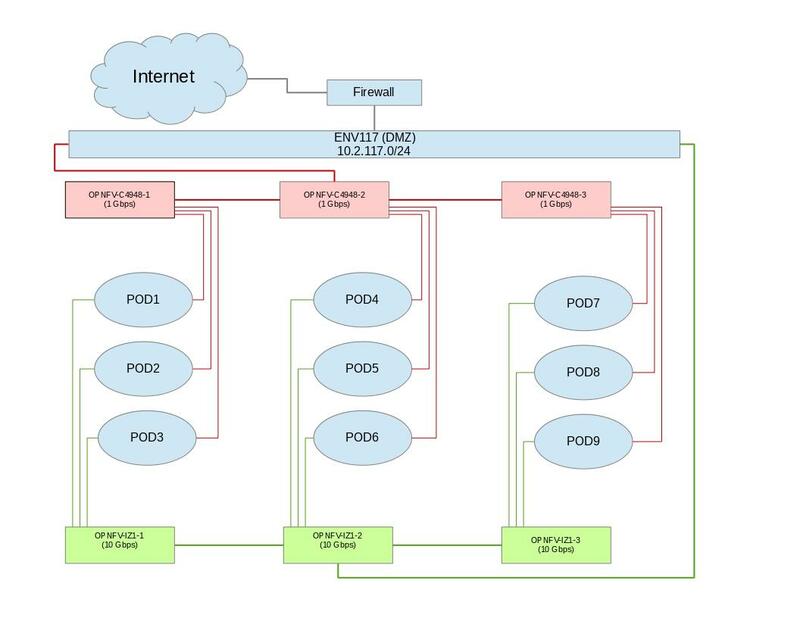 Production/CI PODs are required to be connected to OPNFV Jenkins and available on a 24/7 basis other than scheduled maintenance and troubleshooting. Jenkins slave status can be seen on Jenkins dashboard https://build.opnfv.org/ci/computer/ . Provides an overview for setting up a Pharos lab. A full set of PHAROS documents are maintained in the pharos repo. Lab map, organization, contacts, status, location, resources, role, etc. Jump server install procedures are maintained by each installer project. Addional Jump server configuraton BKMs will be maintained here. Let’s take CentOS7 for example. The below install information was used for Fuel(up to Danube, and it is replaced by MCP since Euphrates). Connect to the console of the installing VM with your favorite VNC client. The Dell OPNFV testlab is free to use for the OPNFV community. A VPN is used to provide access to the Dell Testlab. Processing the request can take 2-3 business days. To access the Testlab, please visit the Dell OPNFV Lab’s wiki page (https://wiki.opnfv.org/dell_hosting) for details. Ericsson OPNFV Lab currently has 2 Bare Metal and 3 Virtual PODs available globally (hosted in the GIC). Each POD has 5 servers, comprised of 3 controller nodes (HA) and 2 computes nodes. NOTE: (this make differ depending on scenario). These PODs are dedicated for use by Production/CI. These PODs focus on providing verification, build, deploy and testing for scenarios related with test projects, installer projects and perforamnce enhancement projects, such as KVM, OVS, FDS, etc. In addition to the full-time CI/CD resources, the Ericsson OPNFV lab provides developer labs (DRs) for project usage, testing and development. Resources located in Ericsson OPNFV lab shall only be used for CI, infra setup/configuration and troubleshooting purposes. No development work is allowed in these PODs. Development Work should only be performed on the DR labs assigned to individual projects. 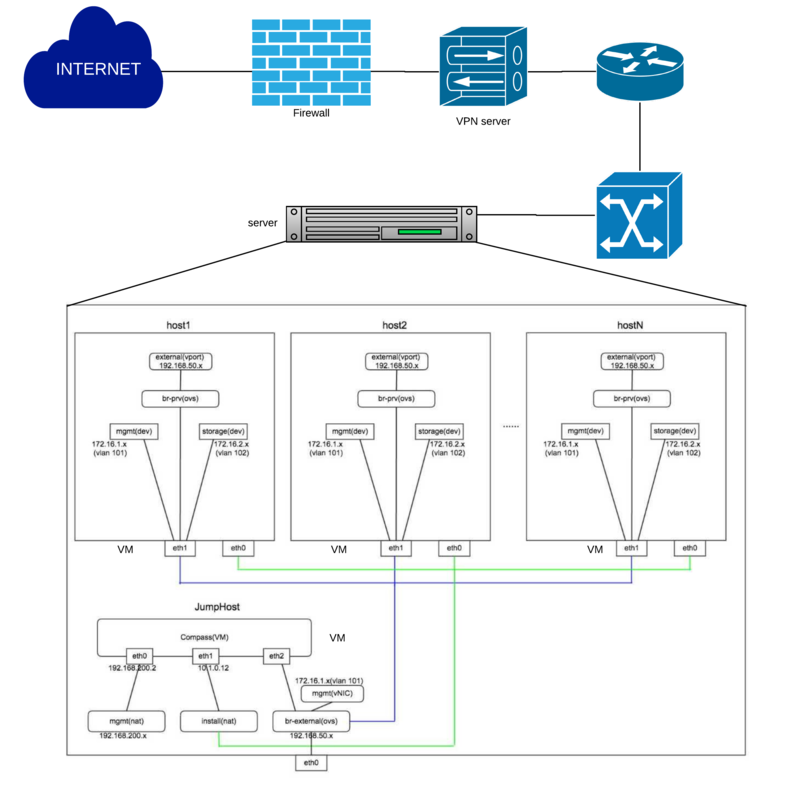 Ericsson OPNFV lab provides a SSH GW that allows for unlimited port-forwarding, as well as Remote Desktop, VNC and SOCKS proxy capability allowing the end user to feel as though directly connected to the lab. Access to this environment can be granted by sending an e-mail to: daniel.smith@ericsson.com. Each POD is an individual entity with its own set of independant networks allowing for interconnection between DR labs, intra connectinos within multiple Nested DRs all without touching the CI/CD running in production. 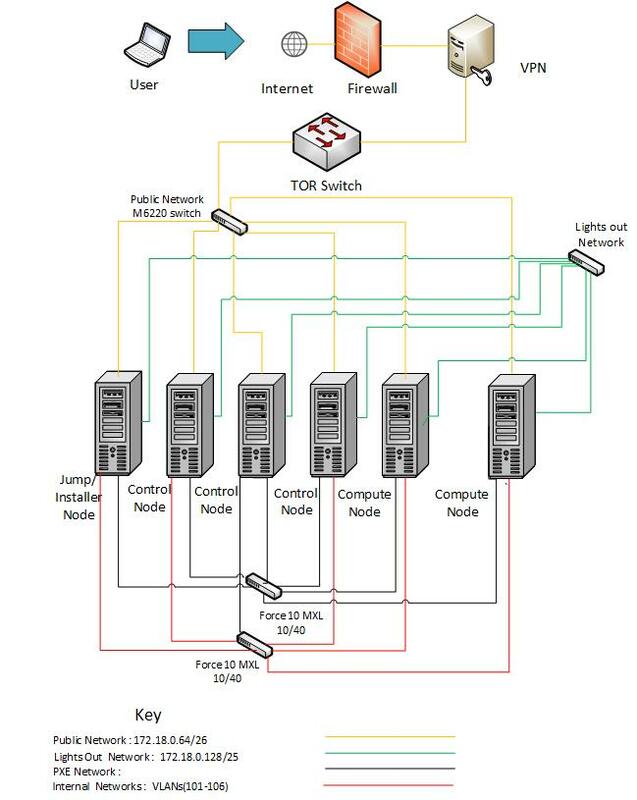 Refer to each Lab specific wiki page for IP and Login and Topology Information. Huawei’s lab providing 5 PODs for baremetal deployment, 4 standalone servers for virtual deployment. All the resources have been attached to jenkins master, you can view the slaves below in jenkins master. Current POD assignments and individual POD details are listed below. All of these resources above are used for OPNFV CI, if there is any requirement by OPNFV contributor or committer for the purpose of OPNFV development, please apply to us for permission. Huawei provides VPN(OpenVPN) to connect the lab. This environment is free to use by any OPNFV contributor or committer for the purpose of OPNFV approved activities, you just need to obtain VPN credentials to access. Granting access normally takes 3-5 business days. Detailed access descriptions will be provided with your access grant e-mail. 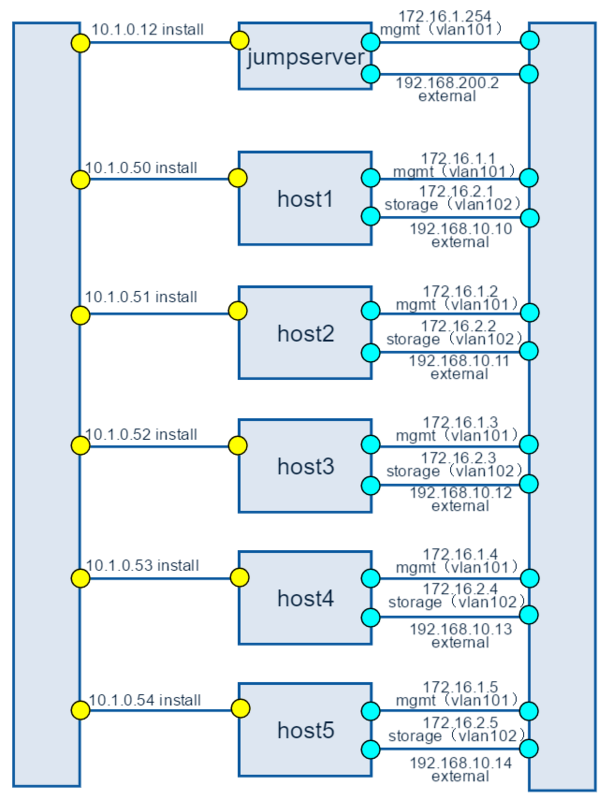 Below you’ll find a topological view of the hosting set-up,you can get more detailed information from the individual POD. NOTE: Illustrated by the example of huawei-pod1&huawei-virtual1. 1 Huawei S9300 10G switch for storage, management and public traffic - 2x10GE to each server. 1 Huawei S5300 1G switch for installing and Lights+out management traffic - 2x1GE to each server. 1 VPN concentrator for remote access and management. 1 Huawei firewall and router for public network secure access. Okinawa Open Laboratory (OOL) provides the following facilities for OPNFV testing. The testlab is now located only at Okinwa in Japan. These resources provided to OPNFV are free to use by any OPNFV contributor or committer for the purpose of OPNFV approved activities by permission of the operator, but shall be used for CI, infra setup/configuration and troubleshooting purposes. 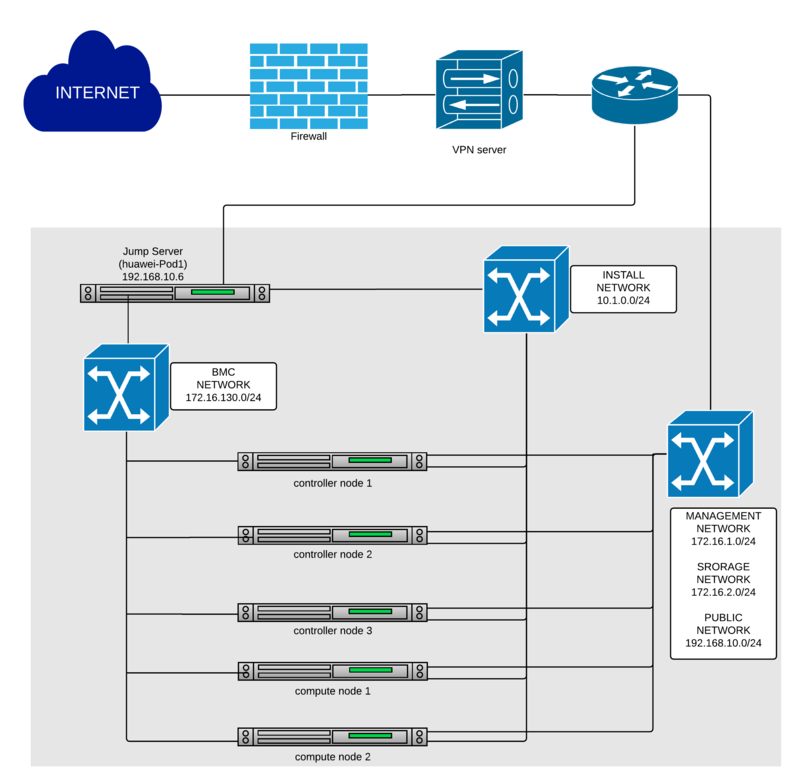 OOL provide VPN(OpenVPN) to connect this testlab. Granting access normally takes 2-3 business days. This is a physical POD deployed by Fuel installer (Brahmputra). This is a virtual POD deployed by Apex installer (master/Colorado). This POD is built on one machine placed next to machines of the physical POD (ool-pod1). Controller and compute nodes are VM. Orange is hosting an OPNFV test lab at Chatillon (near Paris) facility. 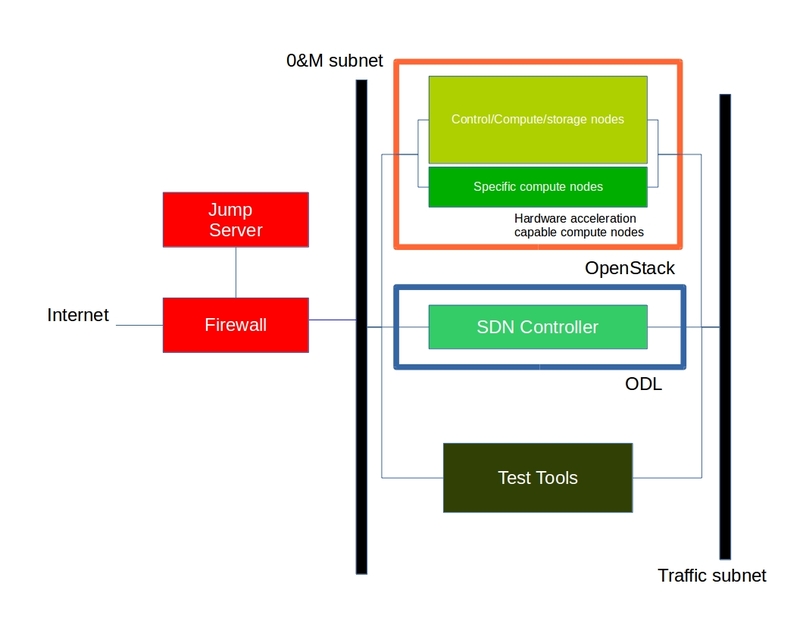 The test lab would host baremetal servers for the use of OPNFV community as part of the OPNFV Pharos Project. The Orange Paris OPNFV test lab is free to use for the OPNFV community. A VPN is used to provide access to the Orange Paris Testlab. Processing the request can take 3-4 business days. Orange is hosting an OPNFV test lab at Chatillon (near Paris) facility. 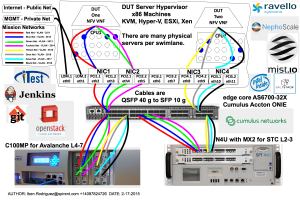 The test lab would host 4 (1 controller and 3 computes) baremetal servers for the use of OPNFV community as part of the OPNFV Pharos Project. A community provided metal resource hosted at Nephoscale, leveraged for SDN/NFV public testing and OpenDaylight, OpenStack, OPNFV projects. 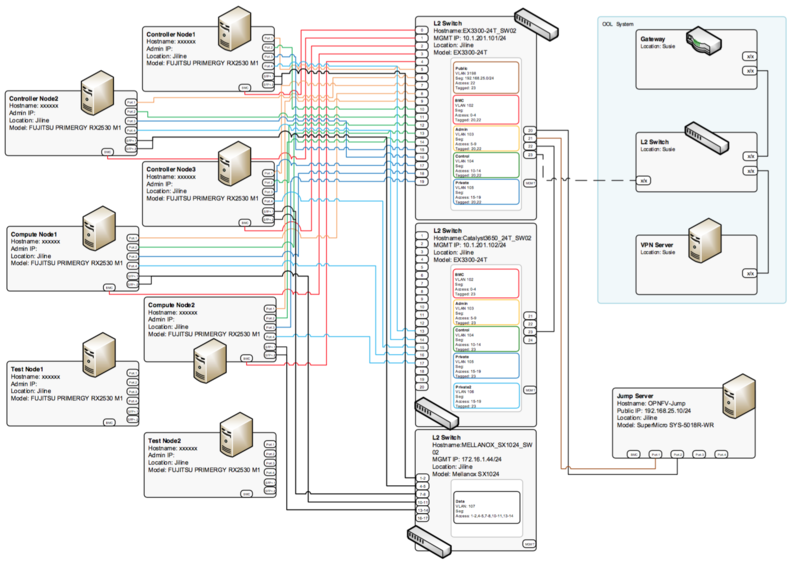 There are a number of different networks referenced in the VPTC Design Blueprint. These can be added or removed as specified by the test methodology. There are 8 x 10 gige SFP+ ports available on a typical C100MP used for Avalanche Layer 4-7 testing. The N4U offers 2 x 40 gige QSFP+ ports with the MX-2 Spirent Test Center Layer 2-3 testing. There are 2 x Cumulus switches with 32 ports of 40 gige QSFP+ ports for a total capacity of 256 ports of 10 gige. We use QSFP+ to SFP+ break out cables to convert a single 40 gige port into 4 x 10 gige ports. Together these offer a flexible solution to allow up to 8 simultaneous tests to take place with physical traffic generators at the same time. Assuming a 10 to 1 oversubscription ratio we could handle 80 community users with the current environment. An 80 Gbps test would need 4 port pairs of 10 gige each and require 8 mission networks. Multiple clients sharing common test hardware might have dedicated management networks for their DUTs yet communicate with the APIs and Management services via a shared DMZ network protected by a firewall. SSL and IPSec VPN will typically be leveraged to connect networks across the untrusted Internet or other third party networks. Stand-alone DUT servers using STCv and AVv traffic generators could easily scale to hundreds of servers as needed. ZTE SH Pharos lab currently has three PODs available in Shanghai. Each POD has 5 servers, 3 controller nodes and 2 computer nodes. These PODs are dedicated for use by Production/CI. These PODs focus scenarios related with test projects, installer projects and performance enhancement projects, such as KVM, OVS, FDS, etc. Resources located in OPNFV ZTE SH lab shall only be used for CI, infra setup/configuration and troubleshooting purposes. No development work is allowed in these PODs. ZTE SH lab provide the OpenVPN access for you. Access to this environment can be granted by sending an e-mail to: yangyang1@zte.com.cn. Once access requirment is approved, the instructions for setting up VPN access will be send to you by mail. All the PODs share the same Jump Host for only one public IP address is allocated for ZTE Pharos Lab. Deploy servers are separated from Jump Host. Each POD has itsown Deploy Server. POD1(means ZTE-POD1) uses Fuel as the installer and performs os-odl_l2-nofeature-ha CI latest verification. Currently, test projects such as Yardstick, Functest are performing daily CI tasks. Fueature projects such as Doctor, Parser will perform daily and verify CI tasks. POD1 share the same Jump Host in the lab. POD2(means ZTE-POD2) uses Fuel as the installer and performs os-odl_l2-nofeature-ha CI latest verification. Qtip daily CI task will be migrated from POD1 to POD2. Qtip is also working on integration with Yardstick umbrella project. POD2 share the same Jump Host in the lab. POD2 share the same Deploy Server with POD1. POD3(means ZTE-POD3) uses Fuel as the installer and performs os-nosdn-kvm-ha CI latest verification. Feature projects like NFV-KVMV, OVSNFV will be run in this POD. POD3 share the same Jump Host in the lab.